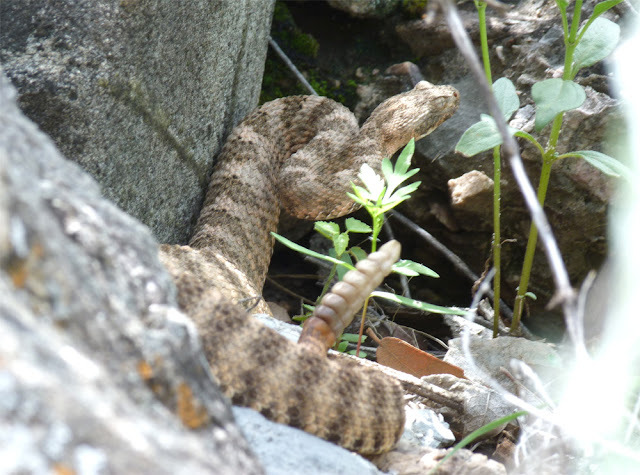 Tiger Rattlesnake (Crotalus tigris) - Montosa Canyon, SE Arizona, late July 2012. A fine spot by Neil Westwater of our Birdfinders group, found whilst the rest of us were busy trying to track down a calling Black-capped Gnatcatcher. Over the years we've seen several different species of rattlesnake on our Arizona tour but this was the first Tiger Rattlesnake that we had encountered. It wasn't large, probably no more than 20 inches in length, and could have easily slipped away unnoticed had it not been for Neil's sharp eyes. Fresh back from another successful trip with Birdfinders, this time to California. 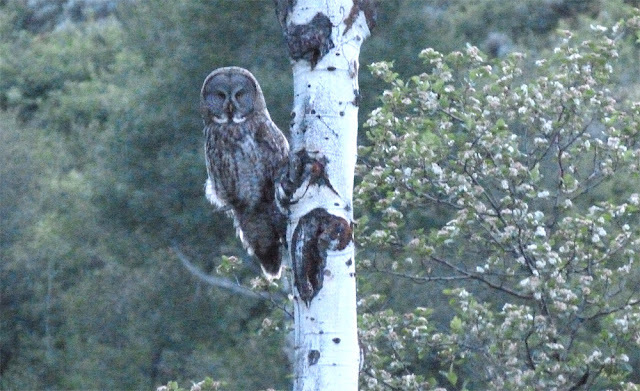 One species that we usually encounter but missed (despite much effort) was Great Gray Owl making this bird seen in June at Grand Teton NP, Wyoming especially welcome. Great Gray Owl - Grand Teton NP, Teton Co., Wyoming. Very grainy shot taken at dusk. June 8th, 2012. Panasonic Lumix FZ40. Gill - A dull, damp, drizzly day but a notable upswing in bird activity around the house this morning. Three hatch-year Yellow-bellied Sapsuckers, Northern Flicker and Hairy Woodpecker were all part of a feeding flock that included about five Eastern Bluebirds, 2-3 American Redstarts, a Pine Warbler, several other unidentified warblers and at least 8 Purple Finches. Indeed, I noticed Purple Finches at each site I visited in Gill today totaling over 25 birds, with at least a dozen Red-breasted Nuthatches in the same locations. 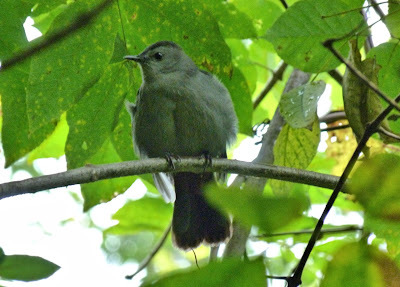 Later in the afternoon our yard produced more than six Gray Catbirds, a female/immature Rose-breasted Grosbeak and a Ruby-throated Hummingbird. Rose-breasted Grosbeak - fem/imm, Gill yard, Franklin Co., MA. September 4th, 2012. Gray Catbird - Gill yard, Franklin Co., MA. September 4th, 2012. 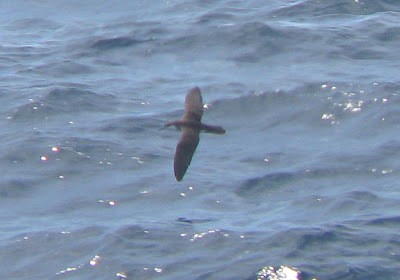 Yet another highlight from the BBC Extreme Pelagic on August 25th/26th. 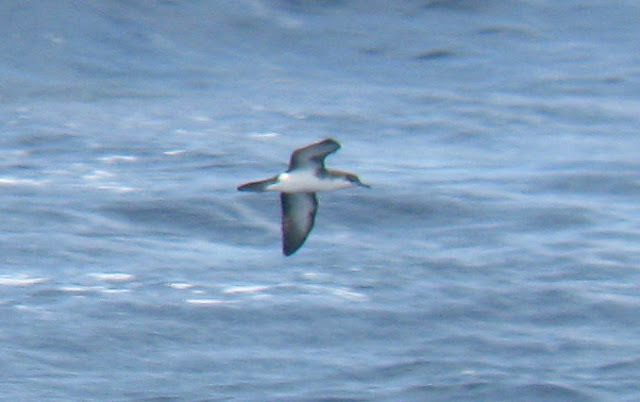 We had excellent views of three individual Audubon's Shearwaters on the 26th, though these numbers were rather lower than might have been expected on a typical late August deep water pelagic off Massachusetts. Still, the quality of the views and the comparisons drawn between these and the Barolo Shearwater(s) seen earlier in the day more than made up for the small numbers of Audubon's. Digi-bin images taken using Leica 8x42 bins and Canon Powershot A590. 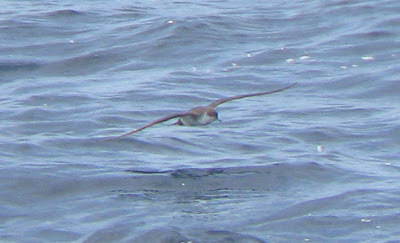 Audubon's Shearwater - exact location?, Massachusetts waters, August 26th, 2012. 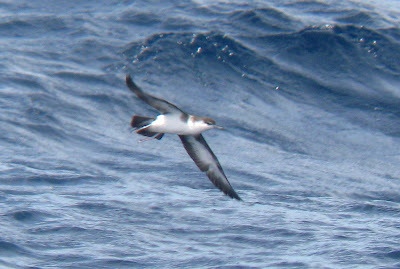 One of two Audubon's giving excellent views on the return journey towards Nantucket shoals. Compared to the Barolo Shearwater (below) seen earlier in the day, the Audubon's appears much darker below, especially on the underside of the longish tail, the wing margins and the neck sides. 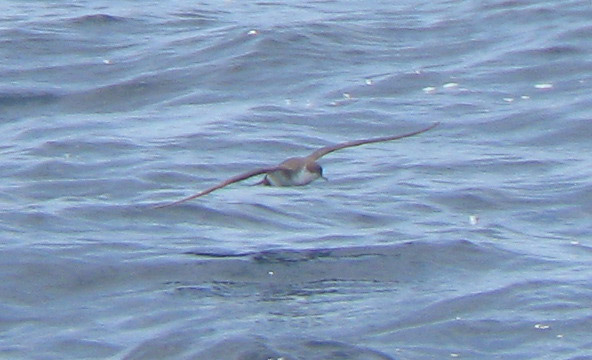 The Barolo appears much whiter below in all aspects with the white undertail coverts almost reaching the tip of the tail. 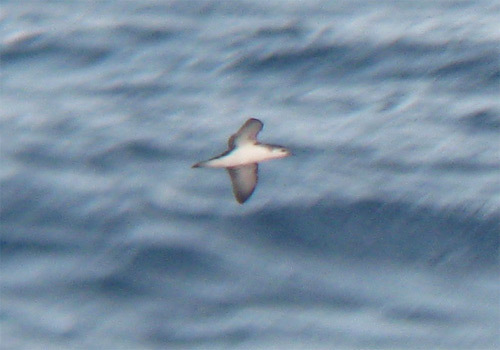 Although difficult to see in this poor record shot, the bill of the Barolo Shearwater is also smaller and finer than Audubon's. What a rare treat to have wonderful views of both of these species in the same day! Labor Day was beautifully crisp and clear from mid-morning onwards. Similar to previous mornings, Red-breasted Nuthatches and Purple Finches vied for attention with well over a dozen of the latter around our home on Main Road, Gill. 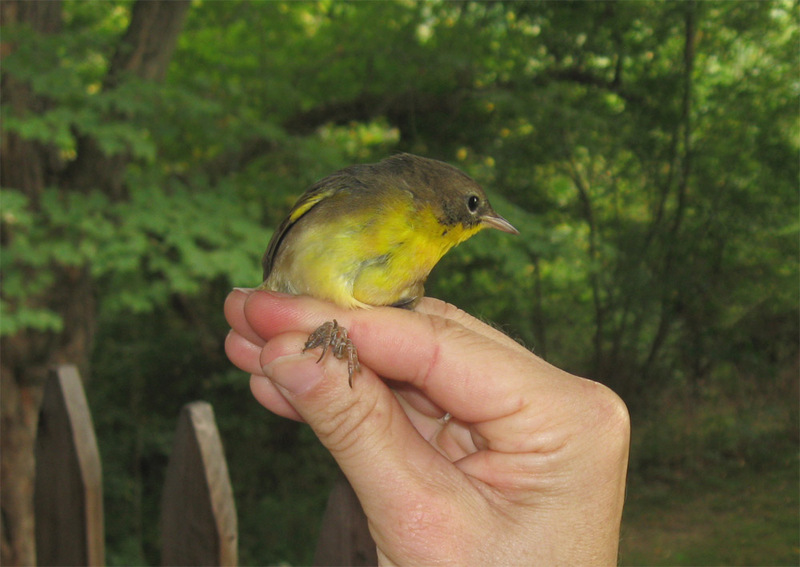 Less expected was a surprise visitor - a Common Yellowthroat had somehow found its way into our basement and wasn't too difficult to catch by hand. Matan, quite naturally, was thrilled to see a yellowthroat up close and personal, and equally thrilled to release it into the yard. 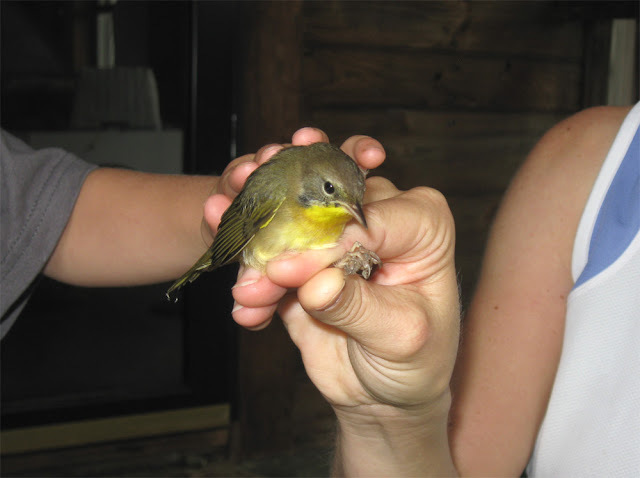 Common Yellowthroat - Gill, MA. September 3rd, 2012. Found stranded in the basement. 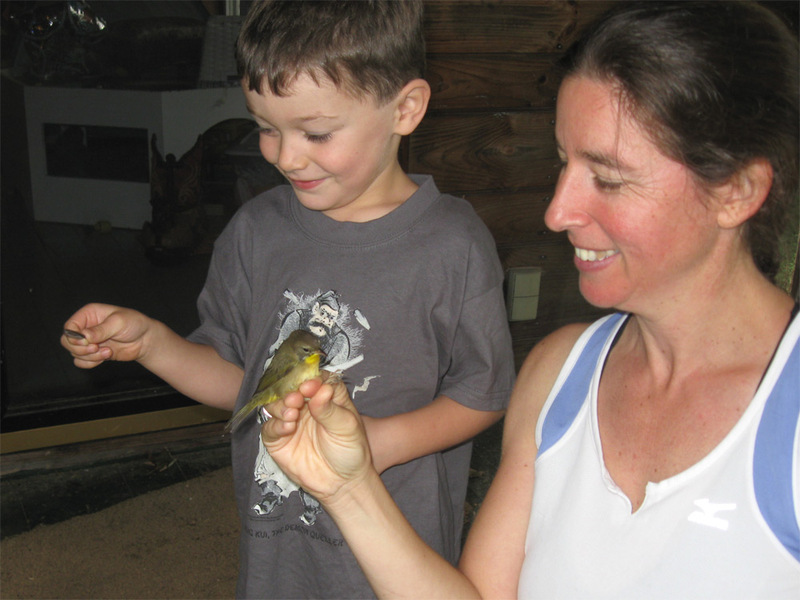 Matan examines a feather dropped by the yellowthroat whilst Mom goes into professional mode. On release the bird flew off strongly 'cursing' all the way into the vegetation. A few Purple Finches along Main Road, Gill this morning including about eight in two parties audible and visible from our yard. At least one Ruby-throated Hummingbird still present in the yard working the feeders and the Jewel Weed. Also in, or close to, the yard this morning more Red-breasted Nuthatches, Rose-breasted Grosbeak, Baltimore Oriole and a singing Black-and-white Warbler. September opened with the second of two very warm days (up to about 95 deg F) in Gill. This morning during a training session at the north end of Mountain Road, Gill I noted at least a dozen Red-breasted Nuthatches in the pines and hemlocks. Several Purple Finches flew over, heading south-west. Calling flycatchers included a single Great Crested and a singing Eastern Wood-Pewee. I may have also heard another flyover Red Crossbill in the same spot, but couldn't be 100% sure (I was running at the time). Still haven't encountered any warblers of note other than our local Common Yellowthroats and Pine Warblers - but there's still plenty of time. 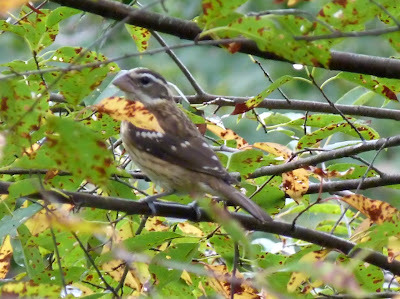 In mid-afternoon a couple of American Redstarts, a Red-eyed Vireo, Rose-breasted Grosbeak and about half a dozen Cedar Waxwings appeared in the yard.